We specialize in Configuration, Training, and Customized Reports. Reshoring, Offshoring and China's devaluation of yuan: How this shakes out for US companies. 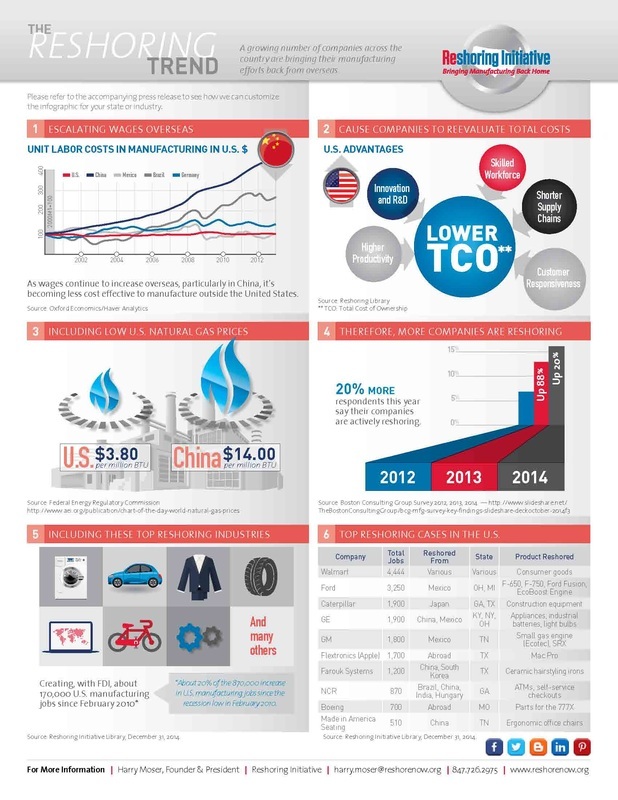 The theme for our quarterly newsletters this year has centered on "Offshoring vs. Onshoring." We've highlighted different aspects of Reshoring topics and their place in the economy 'globally' and manufacturing 'specifically'. With China's recent decision to devalue the yuan, or renemibi , at 6%, our focus now shifts on how this will effect manufacturers at home and abroad. Currency devaluation has far reaching consequences that will affect the future of free trade and the realignment of economic structures for manufacturers. China has decided to devalue its currency, consequently causing a shift in the global market. The result of these actions remains to be revealed in the days ahead. However, China's devaluation of the yuan can be seen as the initial phase of forthcoming strategic economic actions that will significantly affect the United States and the rest of the world. So, how is this relevant to our topic of 'Onshoring versus Offshoring'? Namely, exports of China's products will appear to be cheaper for the United States as we try to purchase them. This will increase demand for China's products and create a surge in China's exports. The next major effect of devaluing China's currency targets imports and the buying habits of the Chinese populace; from businessmen to blue collar workers. The devaluation makes it more expensive for China to buy imported goods while simultaneously increases expenses for other countries to sell their products to China. that de-incentivizes trade with the world. The Chinese government anticipates that the currency devaluation will also improve their GDP. China's leader has insisted that their country's GDP for 2015 increase to 7%! With an already overextended economy, inflation is likely to result in Chinese workers finding it more difficult to put food on the table. The ongoing theory regarding China's currency devaluation is that as exports become more competitive and imports become more expensive, the Chinese government should see higher exports and lower imports, resulting in quantifiable improvement in their country's economic situation. As we look at the chart on escalating wages we can easily see how inflation in China will push wages up as a result of the currency devaluation and will become an even greater driver for Onshoring decisions. We'll take a closer look at China's current manufacturing infrastructure in our next issue - until then, let us know what you think in the comments below! Is Reshoring Picking Up Speed? The Bureau of Labor Statistics (bls.gov) defines off shoring as the movement of American jobs to foreign countries, most notably China. The opposite effect is 'on shoring' or the movement of jobs back to America. This resurgence of jobs back to American soil is picking up steam (in spite of the lack of evidence on the national scale as in our GDP), and boosting individual communities and their families. On shoring is helping entrepreneurs understand that 'American Made' is the most cost effective way for them to manage their supply chain and manufacturing operations. A recent article in the March 2015 edition of Fast Company magazine listed American Giant as 38th on their list of most innovative companies of 2015. Andrew Rice is the author of the article. It is the story of Bayard Winthrop, CEO of the company who decided that the sweatshirt hoody business in America had withered away because of offshoring in the garment business. After sourcing his material to India Bayard quickly became aware of the downside to foreign suppliers when the material he received was of poor quality. Winthrop encountered communication problems as he tried to explain the company's vision and quality requirements to the Indian garment manufacturer. Bayard is a passionate believer in the concept of American Made and was convinced he could design and manufacture a high quality sweatshirt hoody in the United States. He realized that even with a higher price for American grown cotton he could negotiate a price that would allow him to make the kind of hoody he desired ...all American grown and made in the USA. When the dust settled from all of American Giant's search and negotiations with American cotton suppliers and garment manufacturers, their total operation spanned 180 miles in North and South Carolina and included a cotton grower, the fabric manufacturer and a high volume sewing company. In Bayard's scenario, not only has his company, American Giant, scored a success with the community of Middlesex, but also North Carolina industry has been revived. This 'one stoplight town' was a bustling enterprise in the garment industry before off shoring reduced it to nearly a ghost town. Now the community is growing again as evidenced by the sign in front of Eagle Sportswear which reads "We're growing! Seeking experienced sewing machine operators." The parking lot is full and overflows into a second lot. Winthrop hired an efficiency expert to help improve output at the sewing machine factory helping the employees work more efficiently and maintain the quality American Giant requires and in the process has increased workers wages as they continue to improve their efficiency. The sweet spot of this story is the prosperity brought to three businesses and their employees in the Carolinas as well as the success of American Giant, all due to one entrepreneur's vision to reshore his production. An essential element of the Total Cost of Ownership is an up to date and accurate record of all expenses and services required to keep an operation's equipment and facilities running smoothly and dependably. Without this data to include in the TCO tool, the decision to reshore may be flawed and could cost the company many thousands of dollars. With Express Maintenance, companies who are considering reshoring have a major tool to assist them in evaluating the decision. Express Maintenance is the most thorough and accurate computerized maintenance management program with over 120 reports to provide companies with the most meaningful cost analysis for use with the TCO tool. Brown and Associates is an Authorized Partner of Express Technology (ET) Inc. and have 10 years' experience working with ET customers assisting with Product Selection, Implementation, Training, Usage, and Continuous Improvement. Brown and Associates provides supporting Products and Training Services that enhance and extend the use and benefits that can be derived from Express Maintenance and Express Request. Outsourcing, as in moving American manufacturing jobs to foreign countries, began several decades ago as the answer to the challenge of shrinking profits for American manufacturing companies. Recently, however, the price tag on foreign labor has increased and as a result the attraction of moving American jobs overseas has begun to waiver. It has also come to light that there were hidden costs to operating in a foreign country that were not accounted for during the early years of outsourcing when companies were calculating the cost/benefits of establishing foreign operations. Turns out, calculations for Total Cost of Ownership were not thoroughly considered in the decision making process. The result of rising foreign labor costs as well as the hidden operating costs that began to impact the bottom line has been that many companies are re-evaluating their foreign operations. Other factors such as shipping costs, distance from a company's home base in America as well as her consumers, lack of operational control, quality problems which have resulted and many other issues germane to individual operations have encouraged companies to consider moving their operations back to the United States. Migration back to the United States has already begun. Although there will never be a 100% return to the United States because there are many overseas plants that sell to Asian consumers where it makes sense to have manufacturing close to the consumers, nonetheless, the trend is obvious. Brown & Associates is hosting a Four-Part, Nation-Wide Training Event. Starting off in Cincinnati, Ohio...then to Atlanta, Georgia...on to Los Angeles, California...and ending in Dallas, Texas. The event is for Users from hardly any experience, to professionals. The new flyer can be found on the above URL as well as right here. Welcome to our official blog! Take the time to review the new website of Brown & Associates and let us know what you think! Just scroll down to leave a comment! Our new site is located at cmmsmaintenancesolutions.com! The link is located on all pages of our blog site! Welcome to the official blog site of Brown & Associates. Let us know how we're doing.